We spent yesterday evening scouring floors with 220-grit sandpaper. For the weekend, I've hatched a crazed plan involving three coats of clear finish and tenting in the backyard while it dries. If the plan flies, move-in might happen as early as next week. I am ready. Really ready. 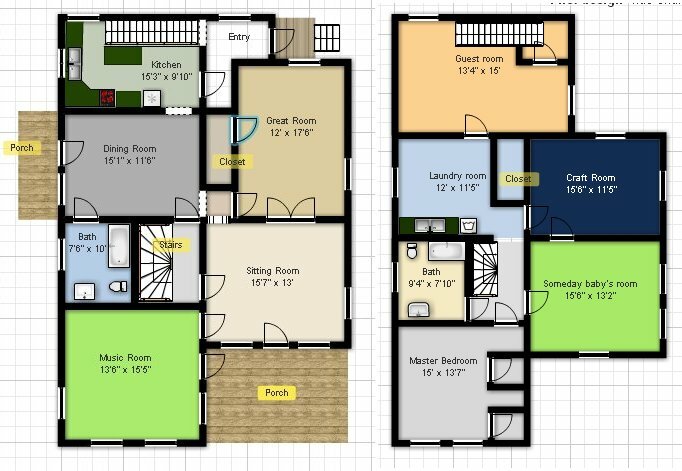 I made this one with Floorplanner.com. I've become obsessed. You can color the rooms as they're painted, you can move windows, stretch furniture, and do all kinds of crazy things. And then you can add stuff. You can dream. You can make a sketch with little boxes and shapes representing what you hope the house will look like in three months. Which is what I did, naturally. I put the fireplace in the Great Room, just the way it will be someday. I put Patrick's big, crescent-shaped music desk in its corner. If only actually moving were as easy as sliding little boxes around. Wow! That's so neat! I have to try it, and I think it will be perfect for planning out the barn layout for the wedding. I was just wishing for something just like this the other day. Not even something like this. This very thing. Thanks! I see an overnight in your new place in early August. It would be perfect for that! Have fun. 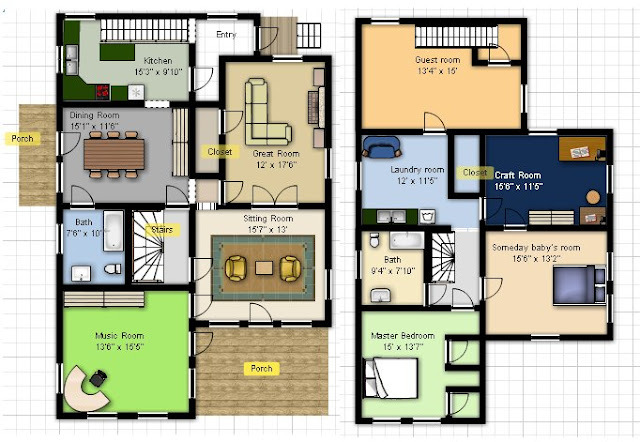 Thank you so much for sharing the floor plan. Makes it all so much more clear!!! Oh, that site sounds so fun! Good luck with the floors! !